Coming down from Loup Loup Pass, there’s a view of the Cascades that’s so compelling that Patty Yates often turns her car around just so she can drive back down the road to gawk at it again. 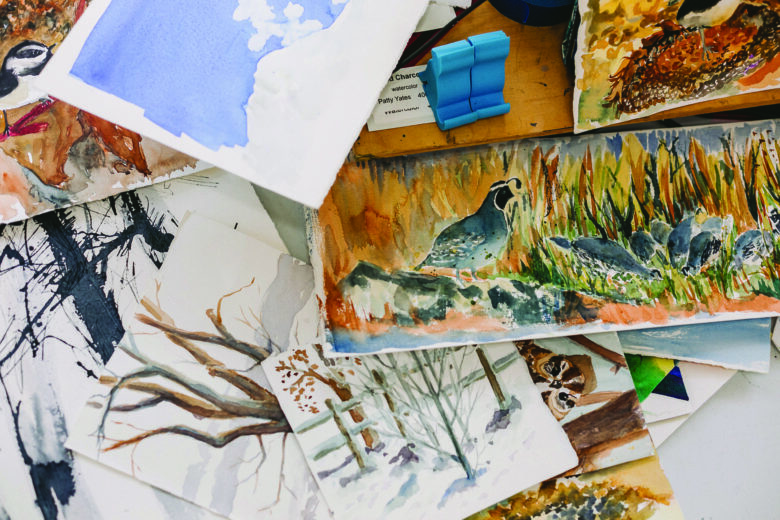 As a watercolor artist, Yates doesn’t view the natural world as merely a pretty backdrop. It’s an organism, a life force. “After my first view of the valley, I asked, ‘Where have you been all my life?’” she said. Yates tracks light, shadow, and color the way someone else would notice a flashing neon sign. She exults in the way the light caresses a familiar mountain range, and in clouds as they morph into new shapes. “I don’t have to go very far to be happy,” she said. Yates estimates she’s been watching 50,000 aspens over the years, observing the trees as they change color, become scarred and pockmarked, and send up tender new shoots. Her favorite grove, near Leader Lake, on the way to Okanogan, burned a few years ago. 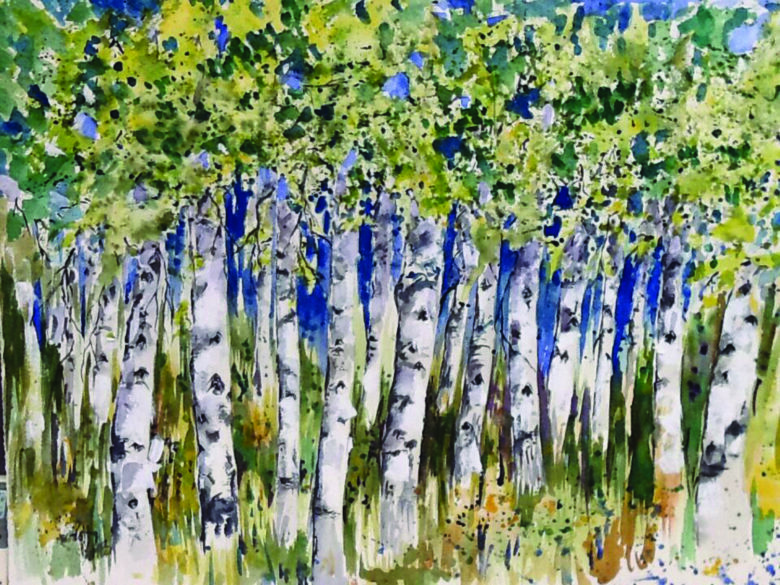 “They kind of call me – those were some of the first aspens I painted. In the fall, they’d turn golden – you could see which sisters were which, because they’d all turn at the same time,” she said. Yates likes the way trees develop character and dignity, much the way people do. “A lot of stuff on their trunks, like eyeballs and colors, reflects things that are happening as they grow up,” she said. 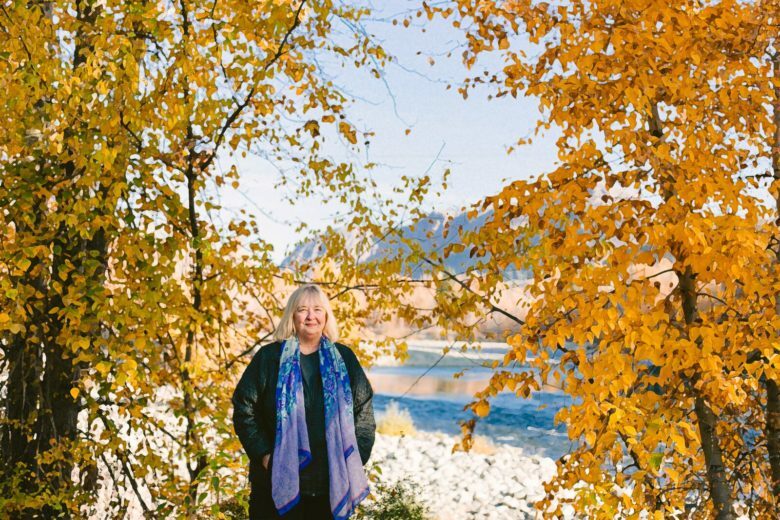 She’s painted aspens hundreds – maybe thousands – of times, in every season and in different mediums. In one painting, a grove of aspens, their trunks flecked with black and russet blotches, casts a stately silhouette against a snowy backdrop. Another presents aspens in a limited palette of black and grey, with watery smudges for trunks and a tumult of black streaks and spatters for the branches. Sometimes it’s fences that catch her eye. Yates sees fences as just one more phase of a tree’s life, with their own personalities and attitudes. Yates is repeatedly drawn to certain subjects. There’s the pair of hills that frame jagged peaks in the distance. “I have painted that so many times,” she said. But the hills are always different. “It’s the sunshine, clouds, weather, the height of the sun in the sky, or the reflective quality of snow in the winter,” she said. 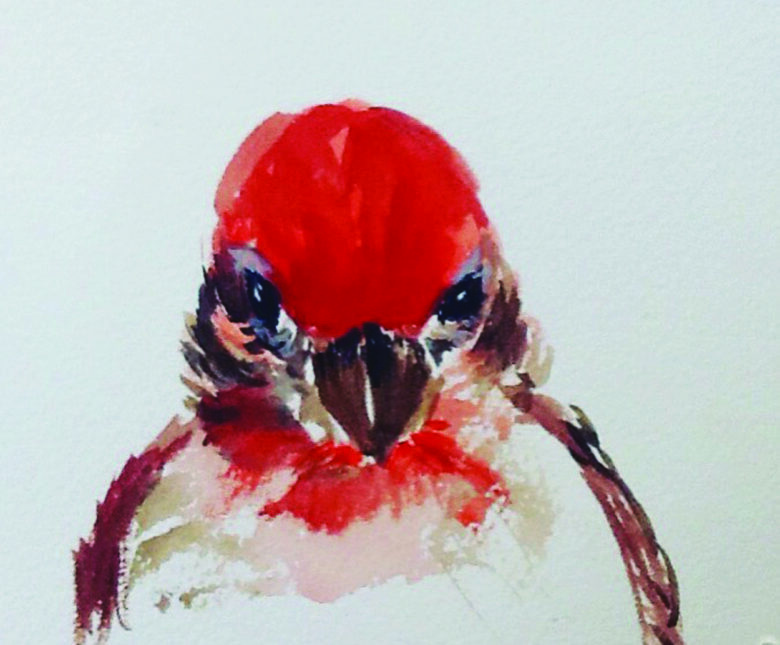 Along with trees, flowers, and mountains, Yates likes to paint fish and birds, which she imbues with so much personality that they seem like a series of portraits. She recalls the joy she felt watching koi in a pond. “That got me interested in what fish were about – and in the humor of fish,” she said. Her fish are rendered in yellows and oranges that shimmer in a sea of aquamarine and purple. And then there are the birds. “Watching birds on sunflowers – I can just sit and gawk. It’s like I’m in the zoo, except they’re free,” she said. Lately Yates has been doing a series of informal bird portraits. In one, a spotted towhee is dwarfed by a massive sunflower head. In another, a black-and-white chickadee stands out against ochre and olive-green of seed pods and leaves. A tiny house sparrow nearly fills a sheet of paper as it stares straight ahead, framed by close-cropped branches. Yates works mostly in watercolor. Her watercolors have a loose, relaxed quality, where a few deft brushstrokes convey the angle of the light and changes in weather. She indulges the translucency of the paint and the texture of the paper. Some paintings are explosions of color, so closely cropped that they’re almost abstract. But for trees in the fall, Yates often turns to acrylics to convey the intense color and the texture of the leaves. “I love color. Since I paint in watercolors, things are not always as bright as they can be,” she said. Her acrylic paintings have a different sort of vitality, from the richness of the color and the swirling energy of the paint. “Watercolor is my love, but I love to experiment with stuff and try different things,” said Yates. She likes to paint on silk, creating shimmering circles of color painted with fish or flowers. Recently, she’s been playing with cold wax, which she scrapes with a knife and spreads on the canvas in abstract patterns. In another technique called paint dumping, she mixes colors in a cup, swirls it around, and upends it on the canvas. “It runs out and it turns into fantastic, phantasmagoric things,” she said. Sometimes these mesmerizing swirls become backgrounds for trees or mountain landscapes. After she drew on a wall with lipstick, a family friend gave her a stick of charcoal and a notebook. 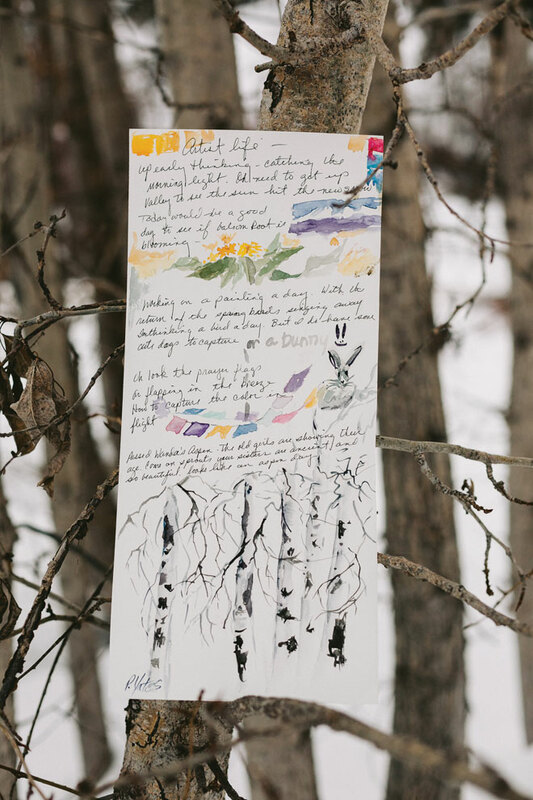 She filled the entire notebook with drawings of a forest. “That was how I expressed myself – on paper, or by building something,” she said. Yates studied art in college. “I had a lot of fun in school – it was using the other side of your brain,” she said. Although she enjoyed ceramics and sculpture, she always came back to painting. After college, Yates found a job as a truck driver and plied the route from California to Nevada for 13 years. Even that gig honed her artistic vision. She made art whenever she could, sketching on scraps of paper and even on her log book. “And I did a lot of painting on my eyelids – I collected beauty as I was going down the road,” she said. After she moved to the Methow, Yates spent 16 years in the restaurant business, grabbing time during the slow seasons to paint. She’d retreat to the mountains or the ocean and “paint my guts out,” she said. Even now, with unlimited time to make art and a brand-new studio out her back door, Yates doesn’t stick to a schedule. “I’m totally undisciplined. I have ideas and little pieces of paper. I wander out to my studio with ideas and get waylaid by other things. It’s wonderfully fun – I don’t have time constraints,” she said. “But then the light changes – or the shadows change – and it’s so gorgeous, I have to paint it,” she said. Even a blank sheet of paper is an inspiration. “Any sheet of paper – especially the one I love – gives me a thrill,” she said. When that sumptuous paper was discontinued for a while, she was devastated. 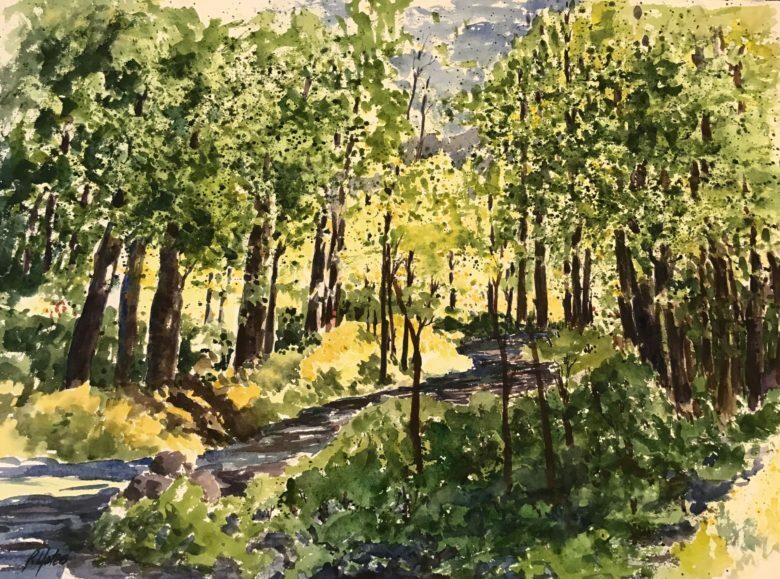 Many watercolor artists plan meticulously, knowing where they want the white of the paper to show through, but Yates tends to be spontaneous when she paints. Still, as soon as she dabs a brushstroke on that precious paper, she’s convinced she’s ruined it. Then, since she’s already spoiled the paper, she figures she might as well just keep painting. “It’s like having faith. It’s going to be wonderful, because there are so many surprises in watercolor,” she said. Yates often paints from photos she takes for reference. In warm weather, she goes out with other artists to sketch and paint outdoors. 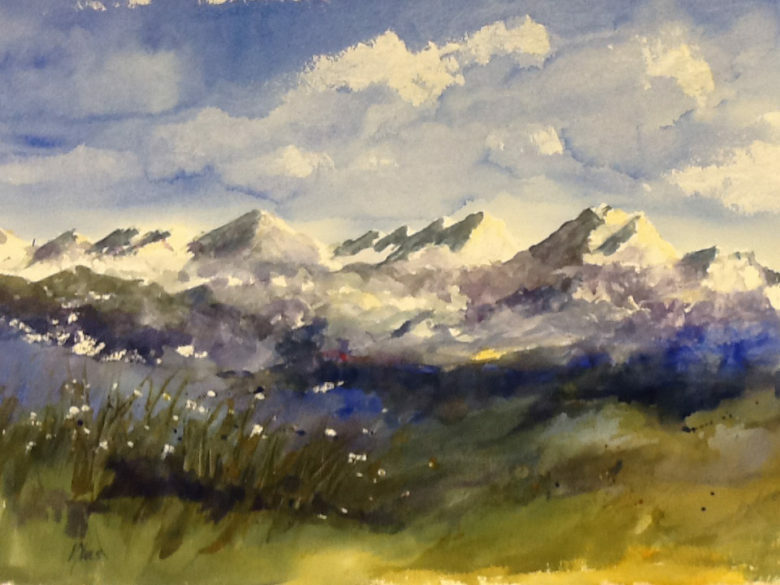 Another source of inspiration is a weekly gathering with a group of watercolorists. Yates used to lead it as a class, but now they mainly paint and share ideas. In her studio, Yates may put on a bad movie as background while she paints. She doesn’t really watch the movies – in fact, she often uses the computer screen as an easel – but she finds the dialogue supplies a creative backdrop. For years, Yates exhibited at a gallery in California, even after she moved to the Methow. But about two decades ago, she got involved with the Winthrop Gallery, a cooperative gallery where artists do everything, from hanging exhibits to tending the store. 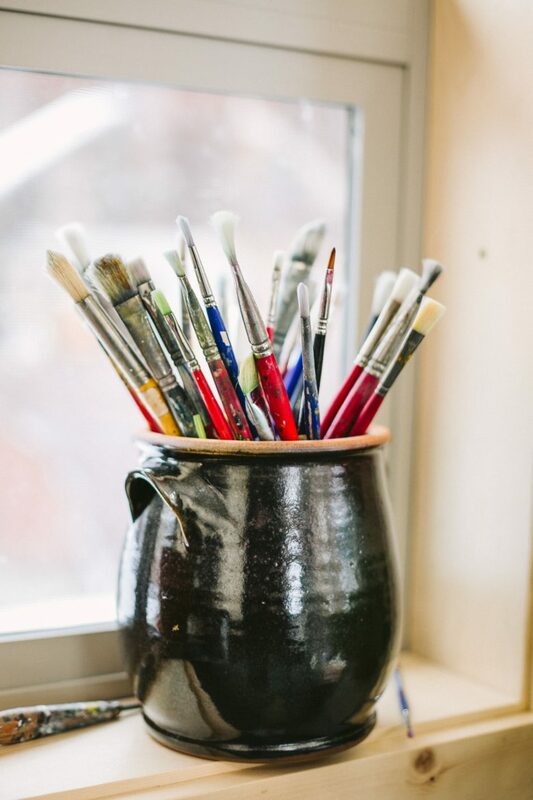 The gallery has carved out a successful niche among shops that cater to tourists, appealing to visitors and locals with paintings, photography, woodwork, ceramics, and jewelry. For Yates, the gallery is not only a place to exhibit and earn her livelihood, but it’s also a source of inspiration from fellow artists. 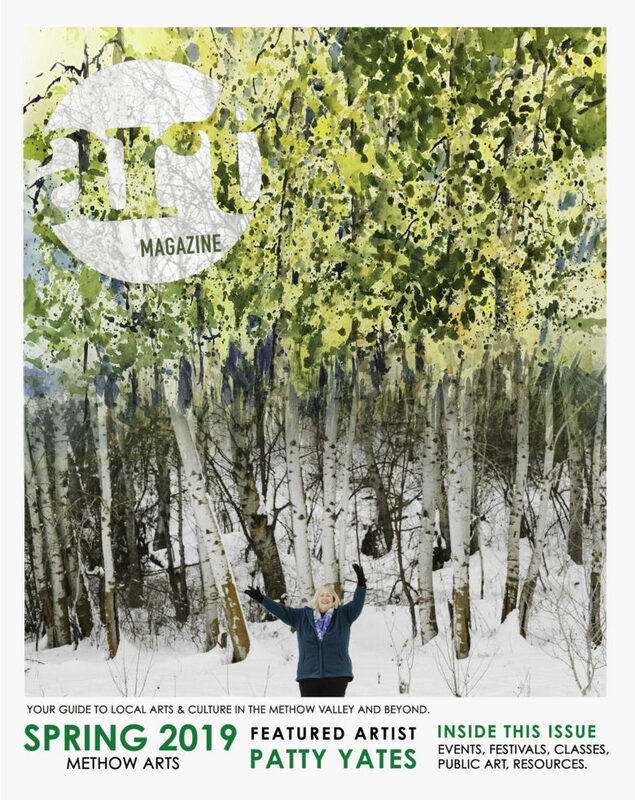 “The gallery is just like a driving force of nature – and art – to be there in Winthrop,” she said. “I’m really easy – the beauty of something will get to me. It doesn’t have to make sense to anybody but me,” she said. Photographs were taken by Sol Gutierrez.